The Ferrari Portofino was introduced to the world back in September 2017 as the replacement for the somewhat maligned Ferrari California T. Personally I wasn’t a fan of the California T, so I’ve been looking forward to seeing what Ferrari have done to improve their GT (grand tourer) line of cars and to see if the Portofino lives up to the claim of being a Ferrari that can operate as your daily driver. First, why Portofino? What does it mean? A few people I spoke to hazard a few guesses at open air, open top. Unfortunately ‘open’ in Italian is ‘aperta/aperto’. Close but not quite right. Portofino, I’m ashamed to admit, is actually a beautiful village on the north west coast of Italy that I’d never seen or heard of before. If this Ferrari does nothing else, it’s inspired me to go to Portofino. It looks truly stunning. After a quick online search I can see why Ferrari wanted to name their new GT after such a picturesque location. It embodies everything they want their new car to portray. Anyway, enough of travel destinations, you’ve got the rest of this issue to discover beautiful and exotic locations to add to your bucket list. Back to the car. 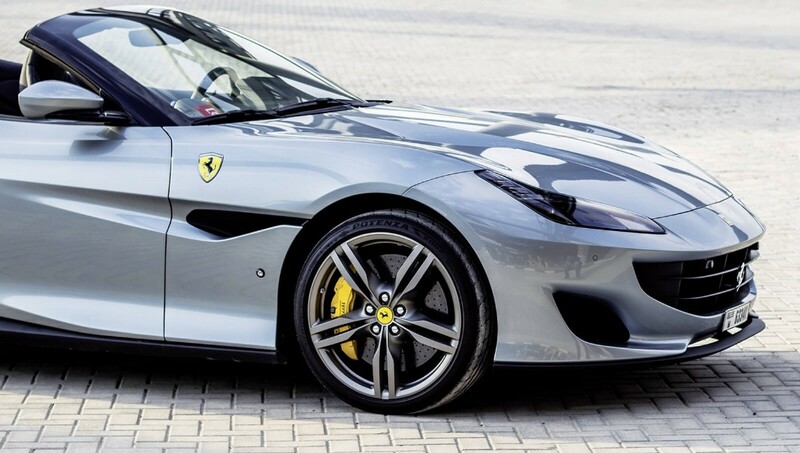 The Ferrari Portofino looks more like a Ferrari than its predecessor. As much as It pains me to say it, for me, the California T isn’t a pretty Ferrari but the Portofino brings the brand back on track with a truly stunning product. Elements of the rear echo the 488GTB and the large side scoops near the passenger doors looks incredible as well as being functional, providing better airflow and asset in cooling the brakes. Inside the Portofino is where I think Ferrari have really made big jumps. 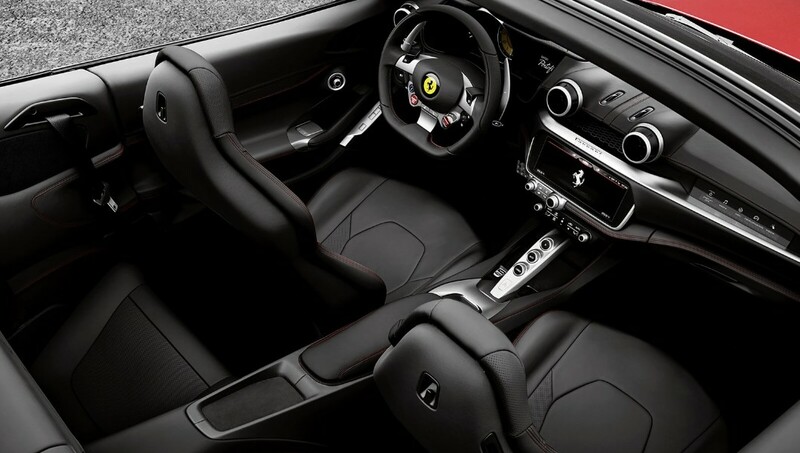 I first witnessed the interior stylings similar to the Portofina when I was lucky enough to spend a day in the Ferrari Lusso. The interior design impressed me then and it took my breath away again. The large sweeping infotainment screen just looks incredible. The display graphics are contemporary, the touch is responsive and it’s simple to use. It ticks all the boxes. The addition of a second, very slim screen for the passenger feels like a pure luxury add-on. Something that’s never been needed, next to no car has ever put in. Yet every passenger I had in the car thoroughly enjoyed having that screen. It made them feel more involved in the journey. This thin screen isn’t purely for display purposes, the passenger can choose numerous things to look at. For example, they can monitor how fast we are travelling, the G-force around corners or even switch to the current song playing and change the track. I feel that last option could cause some disagreements between driver and passenger when your favourite song keeps getting skipped/interrupted by the person you’re giving a lift to. On the subject of music. The Portofino again shines. The speakers inside this Ferrari are crystal clear even at at ear bleeding volumes. With the music up and top down, if other road users don’t like your taste in music they’d best drive on as soon as they can. They’ll be hearing every lyric and beat clearly as though they were in the car with you. The speakers were another moment where the Portofino really impressed me. It sounds odd, but it often disappoints me when you experience a supercar and the seats are finished with the finest materials, the engine and steering has been finely tuned to give you one of the best rides of your life, yet below-par speakers have been installed so you can’t even enjoy your music while experiencing a thrilling drive. You could argue that you don’t buy a car to listen to music, but I think a lot of people would agree that driving a great car while playing great music is an incredible combination. Even the vents impressed me in this car. Aside from looking fantastic, they’re incredibly powerful. Apparently the system has been redesigned to deliver more air to the cabin (hot or cold) and you can really feel it. The Portofino looks like a Ferrari, sounds like a Ferrari, but does it perform like a Ferrari. After roughly five minutes in the car I noticed how refined the ride quality is. Very comfortable and smooth. It’s raised a few millimetres higher than your 488GTB so there’s no need to press a button to get over speed bumps. The seats hold you just enough when cornering and leave plenty of room for your body to relax when cruising down the highway. The 3.9-litre V8 engine churns out 591BHP and as with most V8s, sounds fantastic (even better with the roof down). It has bags of torque; you hardly notice any lag at lower speeds as you accelerate. 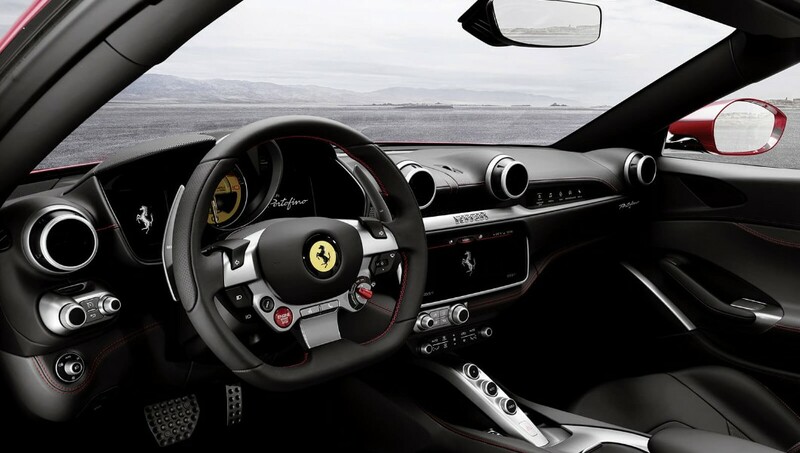 The Ferrari 7-Speed Dual clutch gear box gives you extremely smooth gear changes going up and down. In ‘auto’ mode the Portofino moves at an adequate pace, perfect for touring the Italian riviera. If you wanted a few laps around a race track, use the paddle shifters just behind the wheel and the Portofino moves like a Ferrari should. It has some blistering speed under the bonnet. The Portofino will take you from 0-100km/h in just 3.9 seconds and keep going up to 320km/h. They are some impressive numbers, stats worth of the Ferrari name. However, in the Portofino you never feel like you want or need to drive the car like that. It feels like a GT. It’s nice to know the power is there, but it’s best enjoyed with the top down where you have the choice of two excellent soundtracks (the V8 or your favourite artist through those speakers). The Ferrari Portofino is a fantastic car, worth of that prancing horse on the bonnet. Does it live up to the promise of being an every day car? In many ways yes. The interior has all the creature comforts you need. The glove box is actually big enough for more than a pair of gloves. The boot isn’t much bigger than the glove box though, but that’s the price you pay when you purchase a convertible car. The rear seats could easily hold your weekend away luggage, but you’d struggle to get anyone above the age of 10 back there. Ferrari aren’t selling this as a family car, so that’s OK. It’s fulfilling its promise of a car you (as an individual) can use everyday. No car is perfect and the Portofino is no different. The steering, although extremely precise, feels far too light. I struggled to feel the connection between the car and the road while cornering. The steering wheel is fully loaded like a race car. I like the wheel, but it feels a bit out of place and overly aggressive for a car that everywhere else feels more relaxed, ready to cruise and be driven everyday, which in itself is an issue for me. Would I buy a Ferrari to use comfortably every day, and cruise around in? Honestly, no. I want a Ferrari to have that ‘fun’ factor, where you feel connected to the road, and scares you a bit when you press the noisy pedal. That’s purely personal preference. Ferrari has delivered on their promise of a car you can drive everyday. It may not be one I put in my garage, but I can’t deny it’s a fantastic car. Well done Ferrari and to the village or Portofino, I hope to see you soon.